Kojo Senoo/PIpe Dream Photographer On Sept. 5, multicultural organizations came together in the University Union to discuss culture and ethnicity on campus. 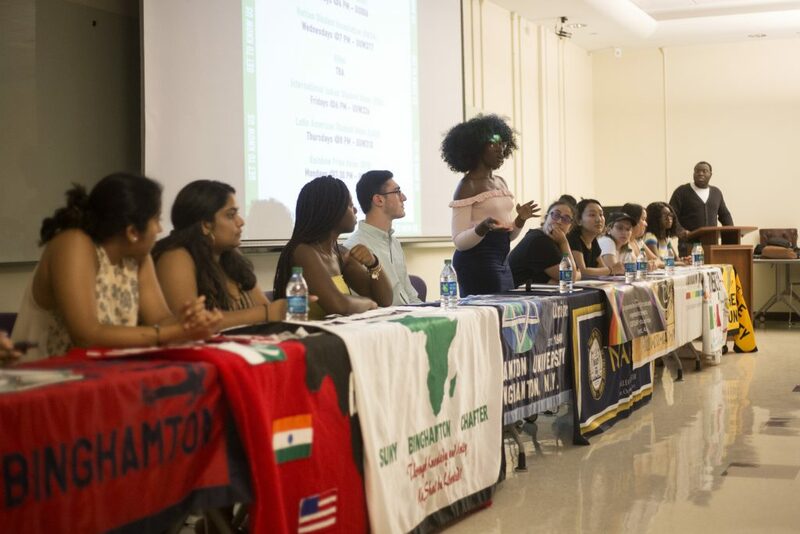 In an effort to foster a discussion about culture and ethnicity on the Binghamton University campus, BU’s chapter of the National Association for the Advancement of Colored People (NAACP) hosted its annual “Get to Know Us” panel on Wednesday, Sept. 5. Held in the University Union, the panel featured various representatives from different multicultural organizations, including the African Student Organization (ASO), SHADES and the Latin American Student Union. Aminata Jaiteh, president of BU’s chapter of NAACP and a senior majoring in psychology, sat among representatives from nine other multicultural organizations. Yasmine Nartey, the vice president of ASO and a junior majoring in philosophy, politics and law, noted that her organization was a place for students to come learn about and celebrate their African heritage. Along with inclusivity and safety for students, all attending groups agreed that a big part of their organizations is the discussion of social issues. With an increase of racially motivated violence in the United States and the Trump administration’s actions toward immigrants, many organizations said they felt they had a responsibility to be more active in the community. The groups also discussed the importance of working together, and agreed they would like to see more collaboration among multicultural groups. According to Madjena Joseph, president of the Haitian Student Association and a senior majoring in integrative neuroscience, her organization wants to create inclusive events. “We plan on having events that cater to the whole multicultural community so we don’t isolate certain groups,” Joseph said. Rachel Anszelowicz, a junior triple-majoring in philosophy, classical and Near Eastern studies and philosophy, politics and law, said she attended in order to learn about each organization’s message and goals for the upcoming year. After running for president of the Student Association last year, Anszelowicz said she realized there were many groups on campus she knew nothing about.